Digital Foundry takes a look at Google's new platform. Now we know what Google has planned for gaming, with the internet giant announcing the Stadia platform today at GDC 2019. What we thought might be a streaming box is instead of a service that will stream to phones, tablets, and televisions. Google's trying to bring gaming to everyone with Stadia, even if not everyone has a great internet connection. The folks over at Digital Foundry have an early hands-on look at the platform, including a deep dive on the technology behind it. All of the hardware exists on Google's server farms, instead of the player's home. The specific Stadia hardware was developed in tandem with AMD, offering more power than is available in current gaming consoles. The manufacturer of the CPU is unknown, but Stadia offers discrete server-class CPU and GPU, making the hardware more powerful than current and potential next-gen consoles, which rely on system-on-a-chip architecture. The full power of the GPU goes to each player instance in Stadia, so your game will draw on the entire 10.7 teraflops. Digital Foundry notes that the hardware can be stacked to handle different tasks, with multiple instances of Stadia hardware being combined to make more graphically-intensive games. "The way that we describe what we are is a new generation because it's purpose-built for the 21st century," Google's Phil Harrison told Digital Foundry. "It does not have any of the hallmarks of a legacy system. It is not a discrete device in the cloud. It is an elastic compute in the cloud and that allows developers to use an unprecedented amount of compute in support of their games, both on CPU and GPU, but also particularly around multiplayer." Google is aiming for Stadia to be quick and seamless. Game loading times are aiming for five seconds, and Digital Foundry reports that testing Assassin's Creed Odyssey on Stadia saw an extra 17 seconds of wait time on the opening cutscene versus an Xbox One X. Developers for Stadia also side-step storage constraints, something no home console will be able to avoid. Likewise, since users are not hosting the game on their own hardware, patches and updates no longer become an issue for them; that's all handled on Stadia's side. Digital Foundry's test of Assassin's Creed Odyssey was stuck with 30fps performance at 1080p, despite Google promising 4K resolution, 60fps, and HDR support for the final release. 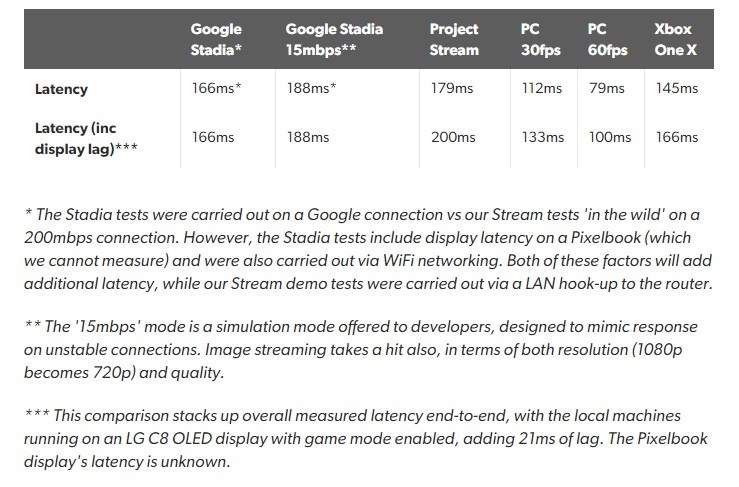 DF tested Stadia on two connections: a full 200mbps LAN connection and a worst-case 15mbps DSL connection. The tests showed a controller response that very close to a local experience. In terms of image quality, testing showed that 1080p streaming will likely be the norm for connections of 25mbps, dropping down to 720p60 for 15mbps connections. Digital Foundry did note that there were artifacts during scenes of fast action, one potential problem with streaming gameplay, and the overall image isn't as sharp due to compression. For the average player, it'll probably be fine, but for high-end enthusiast players, the PC or Xbox One X is still the way to go. On smaller displays, this is less of problem, but on a larger 4K television, the drop in image quality is apparently noticeable. On the flip side, smaller displays look better, but UI elements aren't built for the tiny screen, making some text illegible. The sweet spot seems to be the laptop screen: Digital Foundry said Assassin's Creed Odyssey looked great on a 13-inch MacBook Pro. Stadia is launching sometime in 2019, and Google will be offering further information this summer. There are a number of developers already working on games for the new platform. For more on Google's Stadia, stay tuned to our everything we know guide. Tagged with Android Devices,	Google,	Google Stadia,	News.